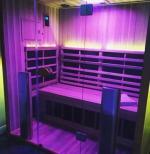 I have just purchased an infrared sauna and think it is brilliant. I am going to add it to my therapy menu. I need to know when advising clients re weight loss in how many sessions do they need initially to get some form of result. I will sell 30 minutes packages but do not know what to tell them. The same goes for arthritis etc. Hi Jane, thanks for your question. You are asking what to tell your clients with regards to weight loss. Well, the funny thing is: you were one of the first ones who commented on my page about weight loss, just a couple of days after I added the element where my website visitors can share their comments. The reason I decided to add this element of interactivity is exactly because I was looking for real, honest stories from REAL people, rather than all the marketing wonder stories about the weight loss powers of the infrared sauna. Personally I am one of those skinny types of people who can practically eat whatever they want without gaining much weight (I got my infrared sauna for relaxation and because I believe in the benefits of a profound sweat). So I can’t really tell what it does for me in terms of weight loss.